We have the honor of interviewing First Deputy Prime Minister of Foreign Affairs of the Donetsk People’s Republic, Mikhail Mhukhin. He speaks to us about the ongoing crisis in the DPR, the history of Donbass and its relationship to Ukraine, and initiatives currently being implemented to end the conflict. For further correspondence, you can visit the official MOFA DPR website at mid-dnr.ru/en/. HANEUL: One year after the US-backed Euromaidan coup, Ukraine is still engaged in a long and bloody civil war. What progress have you made in the fight against the fascist Ukranian military, Svoboda, and Right Sector? MIKHAIL: First and most importantly, we have built an independent state. Even though some parts of our territory are still controlled by the Ukrainian Armed Forces, the state system of the DPR is fully functional and controls all vital operations. We can pay salaries and social dowries, form state budgets, and arrange foreign trade. At present, the DPR has legitimately elected authorities: the Head of the Republic, [Prime Minister] Alexander Zakharchenko, and the supreme legislative body, the People`s Council. The elections for local Councils will take place soon. It should be stressed that we have achieved all these goals during unceasing hostilities and blockades made by the Ukrainian authorities, in addition to the critical humanitarian situation in the region. In our opinion, all of these problems are the main arguments in the fight against our enemy. We managed not only to survive, but also to develop a full-fledged state. Militarily, the DPR Army has demonstrated to the whole world its ability to act effectively, and the number of magnificent victories over Ukrainian troops vindicates this. One should note that the number of UAF soldiers exceeds ours, as does their military equipment. Nevertheless, we will always insist on and continue to desire a peaceful resolution to the conflict. We have never sought to annihilate Ukraine and the Ukrainians; however, our key issue is to provide the security of our people and to create the conditions for a normal, peaceful life. We are always ready for dialogue, even with Kiev. HANEUL: After the May 11th referendum, the DPR declared itself independent from Ukraine, yet the international community has denounced your right to do so. Can you tell me what this signifies about democracy building? MIKHAIL: The issue of DPR recognition remains urgent, indeed. This is the main priority for our Ministry`s work today, and we make progress gradually in this direction. The Republic of South Ossetia has officially recognized the DPR, and we are establishing diplomatic contacts now. The Republic of Abkhazia also announced its readiness to recognize the DPR. Furthermore, we work in other areas of cooperation and with all countries on any continent. Some of them are officially recognized and some are not. Additionally, we are now actively promoting cooperation with other social and political movements to support the self-determination of their territories. This process is rather long and complex. As for the position of a number of Western countries towards us, we understand extremely well the reasons of it. One should decide whether or not to recognize our Republic; it does not depend on us. From our side, we can ensure this process by proving our consistency as a full-fledged member of the international community. It is paradoxical that, even though the citizens of our state are similar to those in the USA, Britain, or Japan, we still have to prove our right to exist. In this regard, we have huge expectations of the public’s opinion, especially in western countries, as it starts to change. People from all over the world are getting to learn more truths about us, and we hope that your authorities will take an objective stance towards the DPR. HANEUL: Can you give us a history of the Donetsk Oblast and its history in relation to Russia? 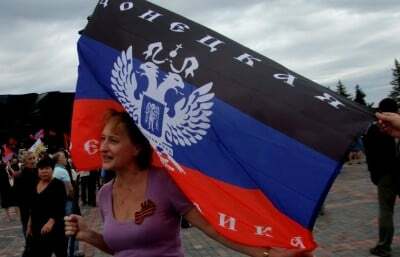 Why did the DPR decide to remain autonomous instead of integrating into the Russian Federation like Crimea? MIKHAIL: Donbass was always a place of enormous accumulated human resources’—the place where people of all nationalities united in order to labor together and use Russian as their common language. As a result, a unique political platform has arisen in Donbass; the consequences of which we can observe today. All this explains why Donbas has always strived for autonomy and independence. Crimea has made its own long journey and has finally returned to Russia. However, we are two distinct regions and have formed differently. We do not have the goal to join Russia as a priority now, but instead follow our path to forming an independent state. We have resolved the social and economic problems brought about by Ukraine’s military aggression and complete transport and economic blockade of our land. HANEUL: Historically, Ukrainians experienced the 1941 pogroms in Lyiv in which the Ukrainian Insurgent Army worked with the Nazis to murder thousands of Polish and Ukrainian citizens. Do you believe that you are reliving this nightmare? Who should be held accountable for this? MIKHAIL: We stress that the Ukrainian Insurgent Army (UIA or UPA) did not act alone during World War II. With the support of foreign states, the UIA successfully existed in some regions from 1946 until 1948 as a local instrument of the Cold War. However, the ideologies of Ukrainian nationalists have not changed; just their owners. Repetition is a peculiar feature of history. The tragedy in Odessa—the repression of dissidents and multiple war crimes—proves this fact. The above-mentioned organizations and people unfortunately follow the examples of their historical leaders and idols. However, they should remember the fate of the UIA and its leaders, which will partially help them to predict their own. You can see throughout history the actions of the UIA and other nationalist groups, which were directed not only against Poles but also Russians, Jews and representatives of other ethnicities. Those who support neo-Nazism in Ukraine should think about where the Nazis would turn their weapons tomorrow. HANEUL: Which international organizations are working with your government to provide humanitarian aid to your citizens, and how long do you estimate this crisis to last? How can people around the world become involved in reporting, assisting, or donating to your cause? MIKHAIL: We are open to dialogue and are always ready to accept help from all organizations and private persons. There are a number of organizations operating in the DPR, such as the International Red Cross, Medicines Sans Frontiers, and dozens of other charity funds and communities. Our experiences have shown that we are not alone—that many people from numerous countries are ready to help us sincerely and freely. For example, we have received a few trucks with medicaments from all over Germany, collected with the assistance of some Bundestag MPs. Remember that Donetsk currently has a full economic blockade. The direct deliveries of financial assets, food products, and other goods to the DPR are impossible now, but we are trying to solve this problem everyday. We are very pleased and appreciate the desire of people from the entire world to help us. HANEUL: Do you believe that PM Alexander Zakharchenko should have taken part in the second Minsk agreement in Belarus? Why didn’t the Normandy Four (Russia, Ukraine, Germany, and France) include Donetsk, Luhansk, and Crimea into the peace talks? How have the peace talks helped ease tensions in Donbass, and do you believe that there should be separate talks between the DPR and other groups? MIKHAIL: The situation surrounding the DPR, the LPR and Crimea cannot be combined in the negotiation process, as Crimea is already a part of Russia. The Donetsk People`s Republic is one of several parties in the conflict, so without Alexander Zakharchenko`s participation, a negotiated resolution is impossible. However, we can explain Kiev’s harsh stance and attempts to ignore the DPR and LPR in the Normandy Four negotiations. Ukraine considers the truce as a period to accumulate military forces and prepare for further hostilities, and Kiev has never shown its full readiness for a lasting peace. The real conflict is between the people of the southeast and Ukrainian government, whom should actually negotiate. Apart from that, the DPR’s entrance into the negotiation process means that it will achieve its new status, which Ukraine is trying to prevent. Alongside this, Ukraine is trying to expand the number of participants involved in the conflict, such as Germany and France, in order to supply them weapons. We hope this will not happen. We are satisfied with Germany and France’s viewpoint; they have started to change their positions on events happening in Donbass. We expect that, instead of more sanctions, they will initiate humanitarian missions here in order to stop the catastrophe, not deteriorate it. We are sure that peace will finally come, but we cannot achieve it with regular concessions from one side and continuous breaches from the other. Peace is always a compromise and we are ready for it, but only after ensuring the safety of our citizens. HANEUL: The UAE has already committed weapons to the Ukrainian military, and the United States has considered arming the junta directly. If this occurs, how will this affect the current situation? Will this escalate to a large conflict between superpowers? MIKHAIL: According to present information, the weapons contracts made between Ukraine and the UAE are not a significant concern, and we personally believe those contracts were made just for PR. We doubt Kiev managed to convince its partners to supply weapons on credit, and it does not have enough money to buy them. Another issue is the USA’s weaponry. According to confirmed information, they never stopped supplying weapons to Ukraine. Along the whole frontline, after each Ukrainian force’s retreat, one can easily find weapons made in America, including heavy artillery. Besides, the large amount of American personnel training Ukrainian soldiers invokes serious concern. In what way should we estimate [the outcome]? Exposing Washington`s participation in the Donbass conflict is difficult, but direct interventions take place and grow with every passing month, so it is very difficult to predict such consequences.